This was originally written as part of a bio post about me, but the bio ended up going a little bit more personal than I had originally intended. There was still the bit about capoeira though, and I didn’t want it to stay in the vault just because I can’t write short, non-personal blurbs about myself. I talk about my introduction to and involvement in capoeira in my series capoeira na roda, capoeira na vida, so with this post I’ll just say a little about capoeira itself. Bear in mind, this is as brief as I can manage to get while still giving a solid overview of what goes on in capoeira. 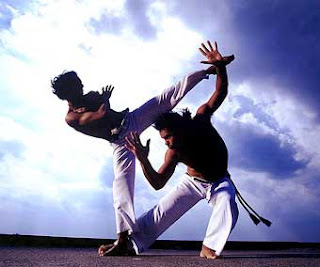 Capoeira is a Brazilian martial art that at its base combines dancing, fighting, and music. The exact time and circumstances of its creation remain unknown, so I’m going to skip over the detailed history of the martial art for now. However, it is known to have been created by Afro-Brazilian slaves some time during the 16th century. 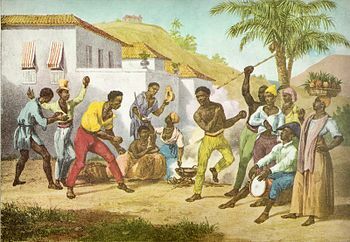 One of the best ways I’ve heard its origin described is as an amalgam of different aspects of the African cultures that were brought together due to the slave trade into Brazil. This makes a lot of sense considering the similarities between the instruments of capoeira and African instruments, as well as the similarities between the religion of many of the blacks that practice capoeira and some of the religions in Africa. And also the black people. Because they’re black people. Anyway, yes. Dancing, fighting and music. At a given a formal capoeira event, you’ll see some standard things. The first thing that you’ll probably notice is that everyone’s wearing white pants and white shirts, with colored ropes around their waists (if it’s a school that practices the Angola style, it may be yellow shirts and black pants). The insistence upon white as the school uniform comes from a man known as Mestre Bimba (mestre = master, much like a sensei in karate, or a sifu in kung fu). Mestre Bimba is the man that legitimized capoeira in Brazil, as before him it was solely associated with black gangs. As part of this legitimization, he insisted that his students wear a clean white uniform, as white is thought to represent purity. 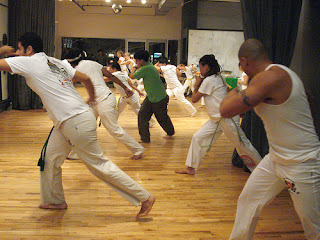 The colored ropes are known as cordas (COR-dahs), and represent a student’s proficiency in their practice of capoeira. The meaning of each color varies wildly from school to school, where a beginner’s white in one school might be a mestre’s white in another. The difference is usually pretty obvious though, even without seeing them perform. The next thing that you may notice is that when two people enter combat, they do it while being surrounded by everyone else who’s there in a circle, much like the fights people might have in high school. This circle is known officially as the roda, pronounced HOH-dah (it’s really important to get the silent “h”). 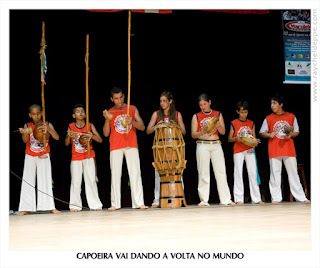 The roda is important to capoeira as it provides structure for the games. Otherwise, the embattled capoeiristas would fight all over the place (trust me, this happens anyway). Some believe that it even provides energy to the fighters, as the energy of the people on the outside of the roda circulates amongst the onlookers and is given to the fighters. Another notable is that when people fight, they rarely if ever actually make physical contact. In fact, many of the fights look like they’re entirely choreographed. This is not something that you’d expect from a martial art. Why is that? The way that it was explained to me (I forget by who) is that capoeira is a game (jogo) first and a fight second. The emphasis therefore is on playing a game that makes people want to watch (in portuguese: joga bonito que eu quero ver) and learn from you (joga bonito que eu quero aprender), and not beating your opponent to a pulp. The latter would be easy, as you could simply rush into the roda, tackle your opponent to the ground, and start pummeling their face. But that removes much of the “art” from the martial art. The emphasis is on technique and fully expressing the movements, as well as having a physical conversation with your opponent by flowing with them. This is where the notion of choreography comes in. No actual jogo is choreographed. There may be some sequences that appear in a capoeirista’s jogo, but it’s all mixed together on the spot. The conversation that two capoeiristas have is one of attack and defense. If I kick at you, you know instinctively to defend yourself by getting out of the way. Then, now that I’m open, you know to attack back, where I’ll get out of the way. I may let loose with a string of attacks, each one you’ll know to dodge. Then you’ll fight back and I’ll try not to get hit. And so it goes on and on. I would be remiss if I didn’t say anything about the ginga, the basic swinging movement of capoeira. In fact, I’d probably be yelled at for it by a variety of people. The ginga is what you do when you’re not doing anything at all. Se não ataca ou defensa, você deve gingar (If you don’t attack or defend, you must ginga). The ginga gives your movement rhythm, and serves as a launching point for any capoeira movement. It gives you your basic stance, guarding your face with one hand and your side with the other, while giving you a solid footing so that no one trips you up too easily. It gives you a little bit of unpredictability too, as you can perform most movements from literally any point in the ginga (if you’re skilled enough). It also gives your particular capoeira game a smattering of your own individuality. Every ginga is different, and while there are many wrong ways to ginga, there’s no one right way. It should never be mechanical, and always have elements of your own personal swing. And of course, always keep your face guarded. Because if you don’t, someone will try to check you on it, and while it is a very quick and direct way to learn to correct your form, a broken nose is never fun. The last major notable is the presence of music. There are almost always instruments at every capoeira roda. The staples are the berimbau, the atabaque, and the pandeiro, though there may be a host of others such as the agogo, and the reco-reco. 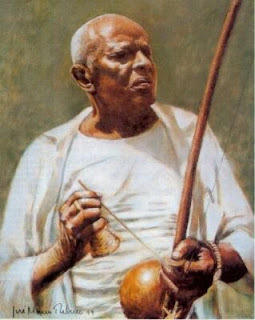 The berimbau is most easily described as looking like a bow (like one that fires arrows) with a large gourd (cabaça) tied to the bottom around the main string (aramé). It has three basic sounds, and is played with a combination of a large coin (or a flat rock, either of which is known as the dobrao) and a long stick (baqueta). The person playing the berimbau will hold the entire instrument in his left hand by clutching the string holding the gourd to the instrument with his pinky, and clutching the main shaft of the instrument (the verga) with his ring and index fingers. He’ll hold the dobrao in between his index finger and thumb, and use it to apply varying degrees of pressure to the aramé in order to make different sounds when it’s hit with the baqueta. The hand holding the baqueta often will also hold a small, wooden, woven container of beans called the caixixi, which will make sounds like a shaker with each hit of the baqueta. The atabaque is analogous to the conga drum, and is a long wooden drum with a head of calfskin. The pandeiro is simply a large tambourine. These instruments form what is known as the bateria, or the band of instruments. The person holding the berimbau controls the flow of each jogo with his rhythm, and also typically leads everyone in song. The atabaque then picks up after the rhythm of the berimbau, and the other instruments after that. Everyone else claps in rhythm to the berimbau and sings the chorus of whatever song the bateria has started. There are meaningful songs and nonsense songs. There are songs for fast games and songs for slow ones. Songs for men, songs for women, songs for birthdays, songs for deaths, songs for newcomers, and songs for farewells. A clever berimbau player will link songs to different rhythms and events in the game. If he’s particularly savvy, he might even start off the roda with a ladainha, which is a long solo at the very beginning of a roda which. At its end, the capoeirista gives recognition to God (or a god), his mestre, whoever else he wants to give recognition to, and to capoeira itself. If people get too far apart, he might start singing “jogo de dentro” to get them to play closer together. If the roda is about to end, he might sing “para roda capoeira” as a send off. And there you have the bulk of it. There will no doubt be more about capoeira on my page as time goes on, but I think that’s a pretty good primer to start with. Here’s a video that I just love to watch which shows you a bit of it in motion (and actually is choreographed). And before you ask, no, I am not nearly this polished.